For Mexico City's biggest businesses and its poorest neighborhoods, rainwater harvesting could help address an enormous water crisis plaguing the city, a recent Columbia Water Center study found. Although critics often contend that rainwater harvesting is not cost-effective in the short-term, the researchers used a new methodology to calculate whether the approach would yield cost savings over 10 years for specific buildings and boroughs in Mexico City and for the city as a whole. "Some people say, no it doesn't make sense, because water is so cheap and will never pay out," said Paulina Concha Larrauri, an environmental engineering researcher with the Columbia Water Center at Columbia University. "But in reality for large consumers…it actually would make sense." Benito Juarez, for instance, one of Mexico City's wealthiest boroughs, could source a large share of its water from rainwater because it has a lot of offices, restaurants and supermarkets that pay high tariffs for their water, said Larrauri. 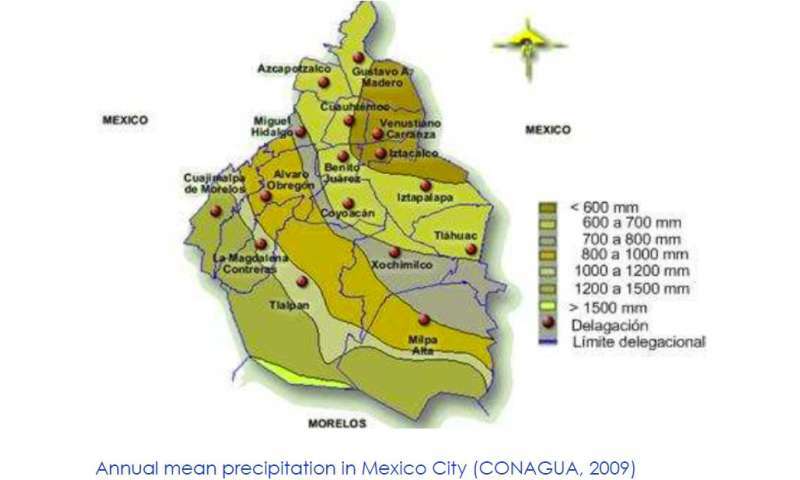 Poor semi-rural villages in the southern part of Mexico City, such as Ajusco in the borough of Tlalpan, could also benefit from rainwater harvesting. Many homes in the boroughs of Tlalpan and Milpa Alta are not connected to the city's water network, so residents often spend an enormous portion of their monthly income to lug bottles of water from pipes on the edge of town and to purchase "garrafones," jugs of drinking water. And that often isn't enough. In these marginalized neighborhoods, the researchers found the average annual percent demand that could be met with rainwater was around 60 percent. To conduct their analysis, the Columbia Water Center researchers collected data on local differences in water demands, water quality, rooftop areas, tariffs and precipitation. Because rooftop area helps to determine how much rainwater is captured, they took samples of rooftop area from city maps. They also calculated the concentration of houses and businesses in different boroughs of the city using data from the Mexico City census and Mexico's National Institute of Statistics and Geography. Then they aggregated this information by borough and calculated the average net present value you could achieve with rainwater harvesting by borough, size of building and type of demand. (Net present value measures return on an investment over time.) They further aggregated by sector: domestic, big retailers and big wholesalers, restaurants and hotels, and calculated demand, cost and precipitation. 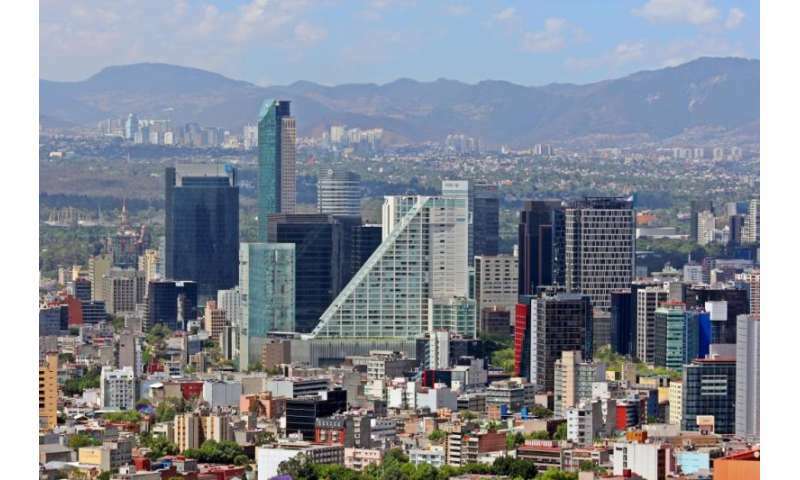 "Precipitation in Mexico City really varies by borough, because there are these microclimates, so you will have a lot of precipitation in the south and half of that in the north, so that really impacted how rainwater harvesting behaves," said Larrauri. 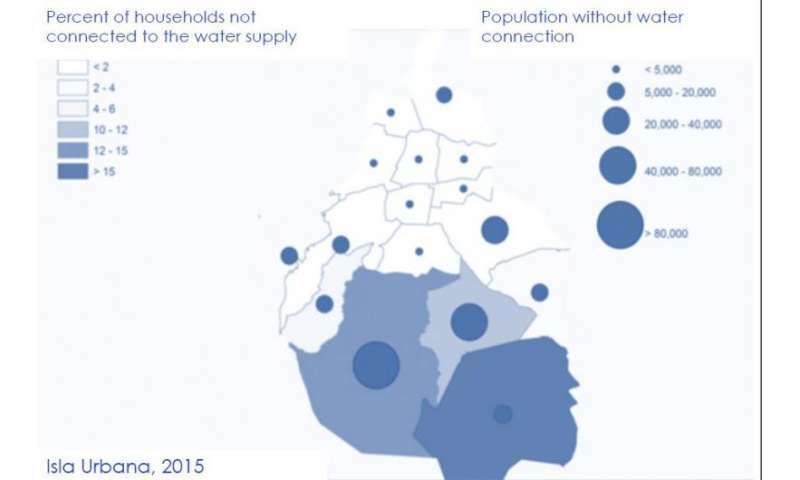 "So in the north you have a lot more commercial buildings that pay a lot of money [for water], but you could not harvest as much rain as in the south, where you have all the poorest areas that aren't connected to the network." Over the past eight years, a non-profit called Isla Urbana has begun introducing rainwater harvesting to poor communities in the southern part of the city, mainly in the boroughs of Tlalpan, Xochimilco and Ixtapalapa, to reduce costs and provide a more reliable water supply. Mexico City's water authority, SACMEX, has also installed rainwater harvesting systems in 85 schools in the Tlalpan and Alvaro Obregón boroughs.